Point A is about having the same process every time. At Point A you have the same thoughts each time, not caring where the ball goes and then reacting the same way every time. Accepting the shot for what it is, always being positive and reacting in a positive manner. Point A has allowed me to take a lot of the stress away. I have been 6 over after 5 holes and then shot even par the rest of the way because I stuck with Point A. My son shared the philosophy of his Point A golf lessons with me. I love the idea of living in the moment and focusing on the things that you can control, rather than the things that you can’t! I’ve found this to be very helpful in my business and life in general. Also, my son’s golf game is improving nicely as he incorporates playing from Point A into his game. Point A allows me to not be so helter-skelter when I am on the golf course. I have a plan that I can fall beck on and if I get off track I just go back to Point A. If I had a bad hole, I remind myself to be at Point A, it’s like starting over again. I feel more in control of me. Now that I am aware of playing Golf from Point A and staying in the moment, I am acutely aware of how my playing partners totally destroy their games with all of their negative talk and expectations. I hear them say, “Well, this is going to be a double.” And sure enough it is. Or “Oh no, I don’t want to three putt like the last hole.” It becomes a self-fulfilling prophecy and they don’t even see it!! 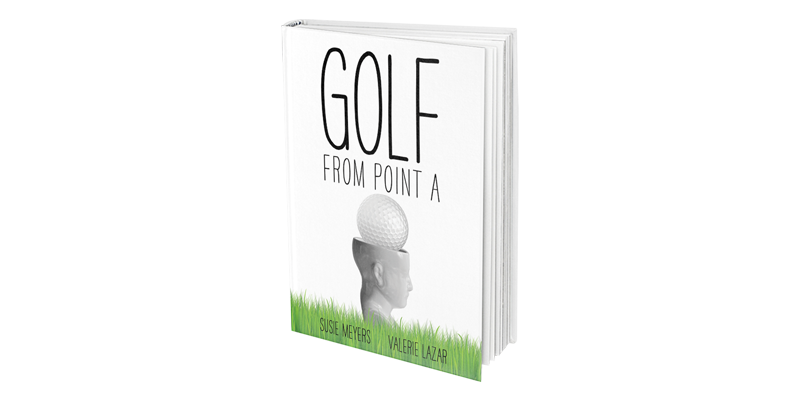 Golf from Point A is helping golfers of all skill levels. Order your copy here.